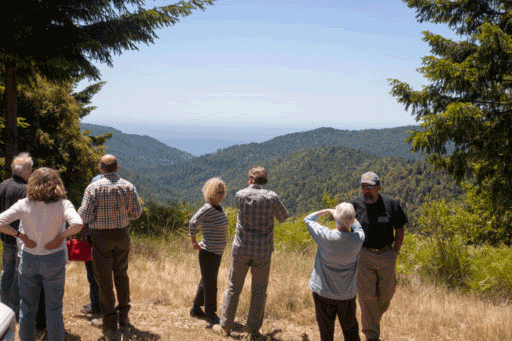 The Redwood Forest Foundation (RFFI) purchased the Usal Redwood Forest, located in northern Mendocino county, in 2007. The 50,000-acre Usal Forest encompasses 69 miles of Class I, 151 miles of Class II and 229 miles of Class III streams. Of this amount, approximately 146 miles of Class I and II flow into the South Fork Eel River and eventually into the Pacific Ocean in Humboldt County. The South Fork of the Eel River is one of California’s most important spawning streams for Coho salmon, Chinook salmon, and steelhead trout. More than 64 miles of Class I and II streams in the Usal Creek watershed flow directly into the Pacific Ocean about 30 miles north of Fort Bragg, CA. RFFI is committed to restoring a landscape that has been severely degraded by aggressive timber harvesting that has depleted the forest ecosystem. We are committed to restoring the essential relationships, values and qualities that characterize healthy forestlands and watersheds. 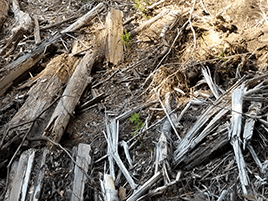 The Redwood Region in general, and the Usal Redwood Forest specifically, have had a tragic history of damage – some irreparable, and some that will take many decades or even centuries to repair. RFFI is addressing the difficult legacy problems and taking steps to correct the correctible. Our plans are always guided by the long-term big picture, but the aim of our implementation schedule is to get restoration measures underway as soon as possible. As forests have come to be valued for more than just lumber, RFFI is developing comprehensive restoration plans. 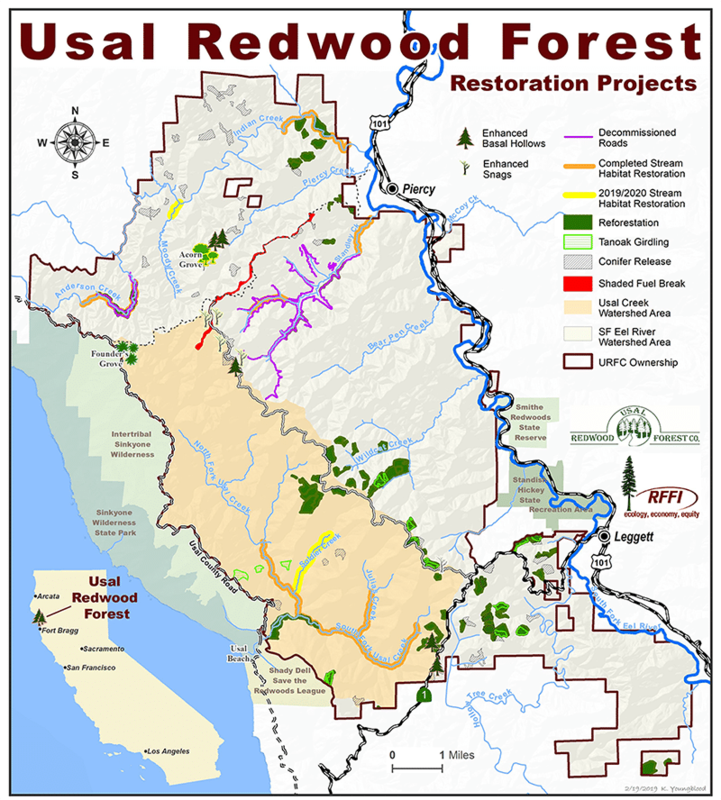 Restoring Usal is part of a much larger forest stewardship program that is addressing problems throughout the entire Usal Redwood Forest. It integrates sustainable silviculture with important recreational, cultural and wildlife elements. The general approach is to conduct watershed evaluation followed by restoration prescriptions. This is being incrementally applied to the whole of the Usal Redwood Forest. We initially focused on adverse road impacts. Removing over nine miles of roads and restoring streams has allowed salmon and steelhead to return to spawn in our coastal streams. The evaluation is now being expanded to include riparian and other interconnected landscape and wildlife attributes. 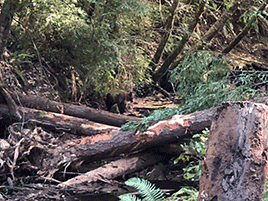 Working with our forest management firm, Campbell Timberland Management, LLC, extensive watershed restoration is underway in the Usal Redwood Forest. This is an intensive and very expensive effort. We have used our investment to leverage more than $4,000,000 in restoration funding. RFFI and Campbell have utilized guidance from experts at UC Berkeley, NOAA Fisheries, California Department of Fish and Game and CalFire in the process. in conjunction with our community partners , RFFI has invested more than $5,000,000 and conducted extensive restoration throughout Usal’s two major watersheds as can be seen here. 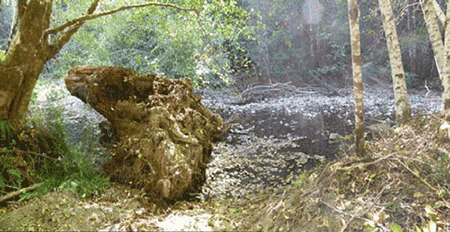 BEFORE: Historic conditions of many coastal streams from industrial logging. Photo taken in Anderson Creek in 1979 (currently on website). This log Jam was a fish barrier at the confluence of Anderson and Indian Creek. AFTER: Anderson Creek at confluence with Indian Creek. 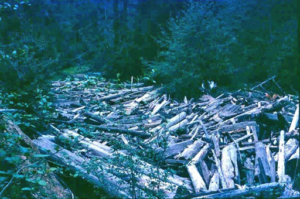 Log jam removed in the 90s no longer preventing salmonid migration into Anderson Creek. 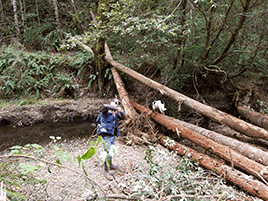 Resident assessing fish habitat at recently installed stream structure on Anderson Creek, 2018. The vibrant Coho salmon seen in the video (above) swam more than 95 miles upstream to spawn in prime spawning grounds in Anderson Creek in the Usal Redwood Forest. The pair traveled up the Eel River, veered into the South Fork and passed through Indian Creek into Anderson Creek. As can be seen in the photos below, the huge log jam above the confluence of Indian and Anderson Creeks would have blocked their trip in earlier years. The logjam formed when logs and debris backed up behind a ‘stringer bridge’ in multiple flood flows. 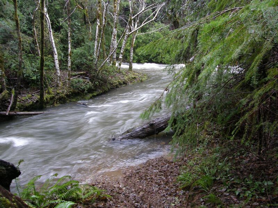 Extensive forest and watershed restoration made it possible for the salmon to return and spawn in an upstream location not much more than a mile east of Bear Harbor and the Pacific Ocean. The reaches under Anderson Creek have some prime spawning and rearing habitat for threatened Coho and Steelhead. Fisheries experts get ecstatic in these reaches – “lots of off-channel, good cover, cold water, and year-round flow.” This prime habitat extends upstream through marshy and low gradient areas close to the western boundary of Usal. These very high stream reaches can often lack abundant good spawning gravels. It is common in these areas to have exposed clay due to past tractor logging and flood impacts in streams and riparian zones. RFFI’s planned restoration projects in Anderson Creek will improve access and spawning habitat for these threatened Coho salmon. DONATE NOW to help RFFI complete road and in-stream restoration projects to improve Coho and steelhead habitat in Indian and Anderson creeks. BEFORE: Creek side road along Anderson Creek (Road Point 466) prior to road decommissioning, fall 2018. 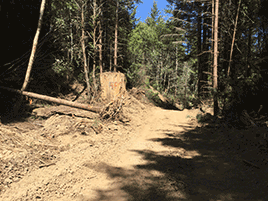 AFTER: Creekside road decommissioned along Anderson Creek (Road point 466), fall 2018. Areas opened during road decommissioning will be planted with redwoods in 2019. Road decommissioning by Pacific Watershed Associates. Tom Leroy, project manager with Pacific Watershed Associates, describing the process of installing this stream structure on Anderson Creek. Once roads are decommissioned and recontoured to the natural slope, they are planted with redwoods. Anderson Creek, 2017. RFFI and their timberland manager, Campbell Timberland Management, LLC conducted studies on the areas, including archaeological studies by the State Archaeologist. Usal had been used historically by local native peoples for these same purposes. The State archaeologist identified a location in which no existing Native American artifacts will be disturbed. Most significantly they see the opportunity for the forest to act as a catalyst to bring tribal people together to teach cross-cultural respect for the land and educate youth in traditional tribal ways. For more information contact morgan@rffi.org. Restoration is moving forward in the Indian Creek watershed. A project to enhance and increase large woody cover, pool frequency, and channel complexity is underway within a 4-mile reach of lower Indian Creek, which is native habitat to Chinook and coho salmon and steelhead trout. A survey of 107 miles of roads in the Indian Creek watershed is in progress. Both field inventories and aerial photo analysis are being used. This project will also create a sediment source analysis report. 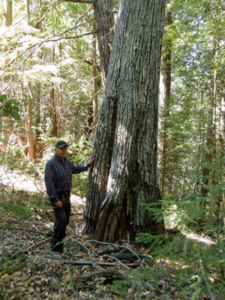 A reforestation project is scheduled for 2014 and 2015, when 1,800 redwood trees will be planted in several riparian areas of Indian Creek. The Usal Creek watershed is another area where RFFI is conducting extensive stream restoration. Usal Creek is 10 miles long and drains approximately 25 square miles of Mendocino County before it flows into the Pacific Ocean north of Fort Bragg, CA. Coho salmon in Usal Creek are state and federally listed as endangered; steelhead are federally listed as threatened. According to the National Marine Fisheries Public Review Draft Recovery Plan for Southern Oregon / Northern California Coast, restoring many key habitat attributes that are in poor condition are crucial to preventing the extinction of coho salmon. This includes but is not limited to increasing large woody material, boulders and other instream features to increase habitat complexity and improving pool frequency and depth. 180 feet of streambank stabilized. 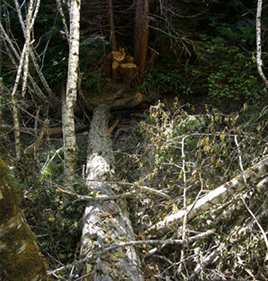 Upstream view of the North Fork of Usal Creek showing dropped trees. and bank in the North Fork of Usal Creek. 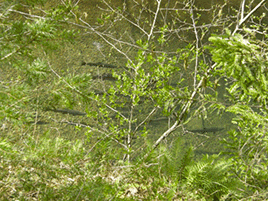 Steelhead are seen in Usal Creek in the Usal Redwood Forest. 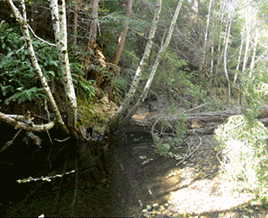 Upstream view showing ‘wood deficit’ in the North Fork of Usal Creek. 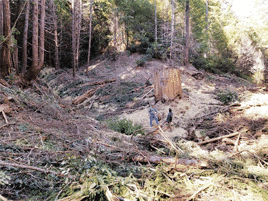 In the photo, you can see that a very large stump was placed on the eastern edge of the North Fork of Usal Creek in an area largely devoid of such large wood features. This large piece is likely to lodge itself in a place that will create an excellent pool and snare other floating wood. Together they will create the desired “habitat complexity” that fish and other aquatic species need for their life stages. These areas had been completely devoid of pools which are essential for salmonid habitat. The restoration work is reaping benefits for anadromous fish. View from the WRP Road to the Pacific Ocean in Usal Redwood Forest.